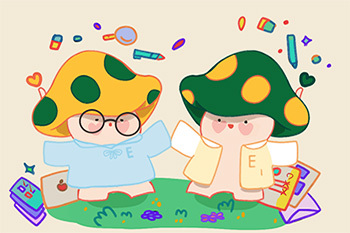 The characters of Mushi & Rumi, a chatbot that provides information on school facilities, schedules, and contacts. Photo provided by Um Seo-young. By typing in short questions or keywords, students can receive immediate answers on campus life, such as school facilities, professors’ e-mail addresses, and school schedules. The messenger system allows students to conveniently find and easily access their needed information. Therfore when students need a professor’s e-mail address, they can simply send to Mushi & Rumi “000 professor e-mail” and the address pops out after just a few seconds. The chatbot only works in Korean, and the English version is yet to come due to difficulties in programming. The journey of Mushi & Rumi started last summer with the two receiving an opportunity to work as an intern at “MindwareWorks,” a software company that makes chatbots for many universities. With the key technology learned through the internship and with financial support from professor Kim Myoung-jun and the College of Science & Industry Convergence, they were able to initiate their project. funds from them yet. Thus there have been constraints on time and training as there are only two students working on an intensive project. However, on a positive note, Um and Kim say that going through trial and error, they have been able to make Mushi & Rumi a more customized system for Ewha students. There are currently more than 550 students who have added the chatbot’s account on their KakaoTalk friend list. The founders have been receiving feedback from users, and the overall reviews are quite positive. “It’s so comfortable that I can find e-mail addresses without having to search through the school website,” a comment from Everytime stated. hilarious that the chatbot provided a link that takes you to information regarding taking a semester off!” another comment stated. Since its launch, Mushi & Rumi has been getting positive feedbacks from students. on including more answers and providing various services students can enjoy.